Synopsis: A Vietnam veteran declares a one-man war on crime in this vigilante revenge thriller. Michael Jefferson (Steve James) saved the life of his best friend John Eastland (Robert Ginty) while the two were serving in Vietnam, so when Jefferson is left permanently paralyzed after a vicious attack by muggers, Eastland is determined to get revenge. Declaring war not only on the thugs who injured Jefferson but the entire lawless underclass, Eastland becomes known as "The Exterminator" for his swift and deadly retaliation against muggers and other street criminals. While Eastland's actions may be making for safer streets, they're also illegal, and just as the mob have put a price on Eastland's head, Detective James Dalton (Christopher George) has set his sights on putting "The Exterminator" out of business. 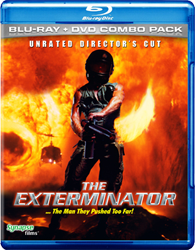 Review: Amongst all the revenge and vigilante films that have been released over the last few decades there really has only been a few that really stick out and shine for their own reasons and The Exterminator is one of those films. 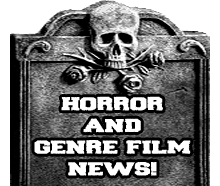 The film surrounds itself around Vietnam vet John Eastland (Robert Ginty) who deceides to seek revenge after his best friend is attacked and paralyzed by a local gang called the "Ghetto Ghouls", and from then he decides to take an all out attack on the sleazy New York underworld! 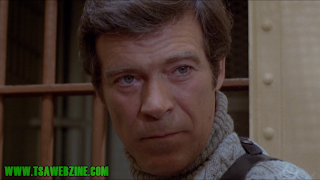 John Easland is very much like that of Paul Kersey (Charles Bronson) of the Death Wish series in the ways of being a normal everyday man who is sick of the filth of the city and is ready to clean it up by any means necessary. Now this film takes a more grittier and dark route and when there is violence for the most part there are no punches held back. One of the key things I liked about the main character is that he is more like an everyday guy and not some smooth and slick professional killer. For me that is awesome because it helps to make the character more believable and in ways likable. Amongst all the action and violence in this film there is some very deep and emotional scenes when John visits his friend in the hospital. Another character that I really did like is the main detective played by legendary Christopher George (Pieces/City of the Living Dead). I have always liked him especially in this film and COTLD. Besides the great acting and characters is this film another great highlight is the locations that they shot at, mainly the Times Square area that was filled with plenty of shady characters during that era of Times Square. Now I have never seen this film on any of the previous DVD releases so I can't really compare them to this release from Synapse, but I can say that this release looks amazing! It has been very well cleaned up but not to the point where it looks over polished also the grain is still intact which is awesome in my opinion. Now as far as the sound goes you get a choice between DTS-HD MA 2.0 Stereo mix and a DTS-HD 2.0 MA Mono mix, either one you choose you can trust me that it sounds great. Overall this is one of the coolest and best vigilante films that I hav ever seen and it's great to see such a film get the proper treatment that it deserved on this release! Great job Synapse!